The Town of Chapel Hill’s Stormwater Management Program is continuing the development of subwatershed planning for the Booker Creek Watershed. The goals of the program are to recommend and prioritize projects that will control existing flooding, stabilize streams and improve overall water quality in the Town’s watersheds. Take New Cedar Fork Survey! Four subwatersheds were identified for further study including Lower Booker Creek, Eastwood Lake, Crow Branch, and Cedar Fork. Completion of the subwatershed studies within the Booker Creek watershed is expected to be a multi-year planning process. These studies all share the same goal – to evaluate the conditions of the creeks and streams and recommend improvements to water quality, flooding and erosion control issues. The Cedar Fork subwatershed study has been initiated. The study area is primarily residential and is approximately 1.4 square miles and just over 900 acres. Of the acreage, around 20% consists of impervious surface. The Cedar Fork study area also contains some of the steepest slopes in the Booker Creek watershed. Field crews will be conducting stream walks throughout the study. 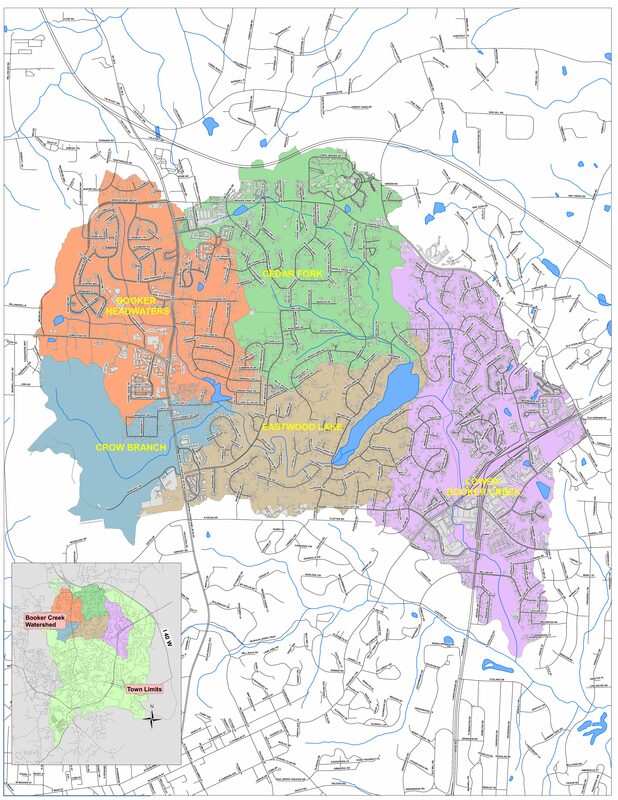 Most of Chapel Hill has been developed as residential area and varies widely in regard to stream buffers, street and stormwater conveyance design, and stormwater control facilities. For these reasons, it is important to specifically assess the stormwater concerns in each area and develop appropriate subwatershed plans for infrastructure and water quality improvements. Continued development of subwatershed plans is a strategic initiative identified in the MASTER PLAN under the Town Council’s Stormwater Program Goals 2, 3, and 4. The Booker Creek Watershed is approximately 6.3 square miles and five subwatersheds. It is composed primarily of residential (single-family and multi-family) and commercial land uses. The commercial land uses are concentrated in corridors along Martin Luther King, Jr. Boulevard, Weaver Dairy Road, East Franklin Street, and Fordham Boulevard. There are two lakes - Lake Ellen and Eastwood Lake - in Booker Creek. Both are privately owned and have been classified as High Hazard per the NC Dam Inventory (N.C. Division of Energy, Mineral and Land Resources). In addition, there are several smaller ponds scattered throughout the Booker Creek watershed. Opportunities for You to be Involved! This web site will provide opportunities for the public to learn about each subwatershed study. Information, updates, maps, surveys, and public involvement opportunities will be continually posted to this project website. Bookmark this site and check back frequently!